The conventional wisdom of blog growth states that those running a website should expect it to take about a year of consistent posting before they begin to see real results. If they are aggressively posting and marketing, that could be cut down to about six months. If you already have a name that is recognized in your chosen industry, it could be almost immediate. However long it takes to start reaching high numbers of regular visitors, there is one goal you should be focusing on from day one: creating a community, not just a blog. Micro-community is the term given to a small, independent network of people that are focused around one blog, site or social media account. Well cultivated micro-communities can end up with active participants in the thousands, even the tens or hundreds of thousands. They hold discussions, share content, meetup in person and establish tight bonds across the globe, all under the banner of a similar belief or interest. If you are starting a blog, or have one already, and you want to establish one of these community hubs quickly, don’t worry. It is totally possible to build one after as little as a single month generating content. All of this comes down to a surprisingly simple collection of tips. What do sites like The Oatmeal, Upworthy and Buzzfeed all have in common? Besides the fact that they are ridiculously popular, of course. All three have their own gimmick, something special that they are known for. The Oatmeal is a comic site with a personal touch that makes it like a cartoon blog for the creator. Upworthy provides socially conscious multimedia with regular focus towards going viral. Buzzfeed could be described as micro-visual blogging. Having something that brands you is a quick way to gain both a name out there on the web (bringing in new traffic and potential community members), and a way to generate conversation with a loyal fan base. Offering something that your fans can “bring home” is another great way to build a community faster. Sending out printed material is one obvious option. Using sites like Print Me Poster, you can also outsource printing and shipping! Are people sharing your content? No? Well, have you asked them to? What about asking them to contribute their stories to a coming post? To give their opinions on a specific topic? To read another post, or watch a video, or do anything that could actively foster a sense of community on your site? Micro-communities thrive on direct engagement. That means not only engagement between you and your visitors, but between themselves. You should give as many chances for that to happen as you can. So don’t just provide a comment section, ask people to take part in it. Don’t just put up social media buttons, prompt people to share the post and help it reach more people. You would be shocked by how much difference just asking for something makes. Want proof of that? Artist Amanda Palmer (Dresden Dolls) had a fascinating TED Talk about her experiences in learning to ask, and to receive. The more you blog, the more varied topics you are able to cover and the more interest you are able to spur. If you feel stuck or you need help writing those articles, use MyBlogU. It will help you in both content idea discovery and content creation: People sending you their blurbs write most of your article for you. Some of my articles I wrote using MyBlogU are over 7000 words! I would never be able to write one myself! A lot of communities on the web are rather large, and spread out to many websites which have their share of devotees. Those blogs often have contributors from other sites on to discuss matters, or take part in discussions, or share expertise. You can take advantage of that by becoming a bigger part of the wider community, and then building a smaller one at your own blog as a result. Guest post often, connect with influencers, and offer free content once in awhile. @Pakwired shares some great tips on networking with influencers. Become a well known name in your interest category, and don’t be afraid to speak out. Become well known for what you do. If you join a larger community, a smaller one will follow. I had my best experience with blog comments, because they tend to be less promotional in nature and more conversational. This is like joining a group of people on the street who are talking about a certain topic, or taking part in a seminar. You’ll stand out with your expertise, but also for your kindness and human warmth. Luke Jordan turned commenting into the effective strategy called Comment Collection. It looks amazingly awesome! Philip Kleudgen of Restaurant Coverings explains this technique in his article on building viral blogs. He just started his blog in November 2014 and got several thousands of visitors right from the start in the first month. The road he tries to go is to reverse engineer successful content pieces from other bloggers and make them better. Viral Content Buzz helps a lot with this strategy. This helps to get some easy traffic-wins in the beginning and scale upwards from there. At the same time he added long 3000+ words articles on his blog to achieve some Google traffic over time. #MBUstorm: This challenge happens 4 times a year, every new season and lets you bring your blog to a new level. Growing a micro-community isn’t nearly as difficult as you would think it would be, or even as time consuming. You just have to be proactive, and a little bit patient. As your numbers grow, so will the connections between users until you have a nice little family congregated in your comment section on on the social sphere. Any tips? Let us know in the comments! Not sure what you mean? Viral just means that your content is spreading rapidly. Ann’s not talking about computer viruses or anything crazy like that. I really appreciate this post. I’ve caught myself being impatient to do something or to reach out to someone of influence because, in a sense, I felt as though I needed to keep up with the fast pace of the business world, when all I need to do is nurture relationships. 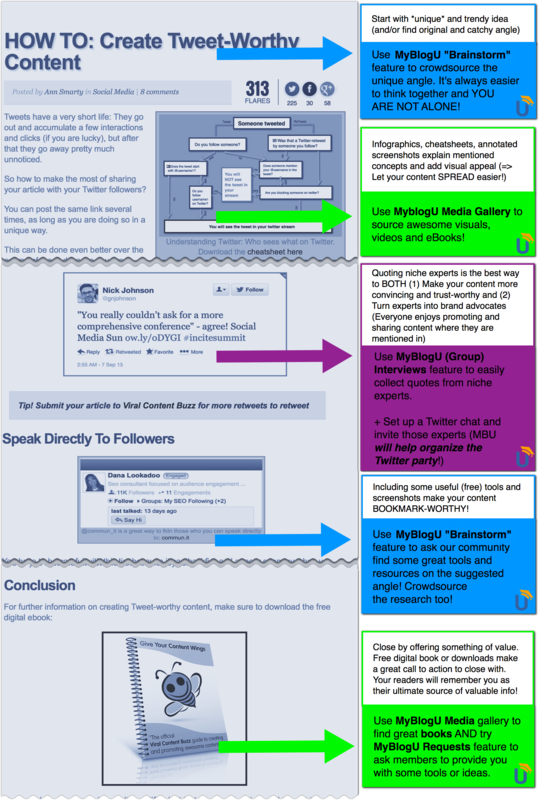 Ann, thank you for sharing this refreshing post on building a micro-community around your blog. Really needed the inspiration because I want to continue to grow the blog to where it has consistent readers. Thank you for sharing this information. I will surely apply all that I have learnt. Glad to find this article. Just started my blog and web a month ago so these insights is really appreciated.